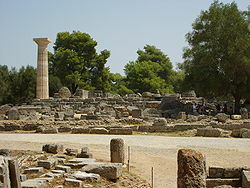 Olympia is one of the most famous and visited destinations in the Greek region of Peloponnese. The main reason by which this destination is so famous is due to the fact that in this spot was were the ancient Olympic Games used to be held, a festivity which was not only important to this region but the rest of Greece and the entire world as well. This destination has been visited and explored by archeologists, historians, and scientists in general from the entire world as well as it is possible to see tourists from all places in it at almost any time of the year. The Olympic Games of the city of Olympia used to be held every four years, in a period called the olympiad, as long ago as the year 775 BC. These games were so important for the city and all Greece that are still remembered and cause this spot to be visited by tourists from the entire world in a constant basis. The city of Olympia is also famous by other elements and attractions, such as per example its impressive statue of Zeus. This city has a statue of great size, made of gold and ivory which represents the Greek God Zeus within a temple built in honor to this deity. This is one of the most interesting statues and attractions in Olympia as well as in the entire Peloponnese. Some of the major discoveries and one of the most important excavations in the city of Olympia took place in the year 1829. In this year, a French expedition started some important excavations and discovered some of the most interesting elements in the area. After this French expedition, a German one followed their work and several important objects, such as tools, and the statue of Hermes of Praxiteles were found. Olympia is situated in an area that is surrounded by hills and mountains in such a way that they provide a very peculiar and interesting background to this ancient spot. Meeting the city of Olympia, its antique statues and ruins can be one of the most memorable experiences tourists can have while exploring the Peloponnese. About the Author - Jakob Jelling is the founder of Eurotomic.com. Please visit www.eurotomic.com/greece.php if you're planning a trip to Greece. In a special place full of beautiful memories, paradise awaits – at the Aldemar Olympian Village. The place where myths were created and the Olympic Games were born. At this land rich in memories, ancient temples, medieval castles and monasteries, where the west coast of the Peloponnese meets the crystal waters of the Ionian Sea, awaits the paradise you always dreamt of: Aldemar Olympian Village. An ultramodern complex of autonomous bungalows, luxurious suites, spacious apartments and beautiful rooms right by the sea, spreading on sandy seashores and ornamented with tens of swimming pools and gardens of unique beauty… A hospitable, lively, tourist village, ideal for sport lovers and children… A little Eden of flavors and local gastronomic creations…yet something more! A unique ark that sails towards your personal summer fairytale, filled with savors of the sea and cuddles of the sun in a peaceful, refreshing environment of harmony, splendor, politeness, discretion and exceptional service. 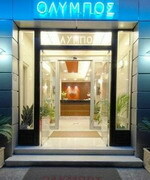 The Olympic Village is a 3 *** Superior Hotel completely renovated in 2000. It is situated in a quiet area, a few minutes’ walk from Ancient Olympia , where you can go shopping or visit the Archaeological Site with the Museum and its ruins. The Hotel has 60 guest rooms which are furnished in an attractive contemporary style for the comfort of our guests. All rooms have balcony with a nice view of Olympia, private bathroom and are equipped with telephone, satellite TV, individually controlled air-condition and hair dryer. 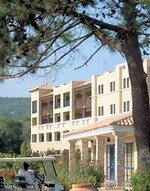 The Hotel’s restaurant offers a variety of dishes, Mediterranean cuisine and Greek specialties, in a relaxed setting. Open daily for buffet breakfast, lunch and dinner. 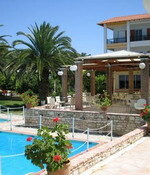 In summertime guests can enjoy our open air restaurant by the swimming pool. At the center of city of Pyrgos, after 40 years in hotel enterprises the Olympos Hotel constitutes an oasis of hospitality for you and your family! In our modern, fully renovated 6-storey complex with spacious parking, you can enjoy your stay in a civilized and friendly environment that combines luxurious services at third class rates. The management and staff of our hotel, are always at your service to accommodate your every need so that you will experience ideal hospitality.